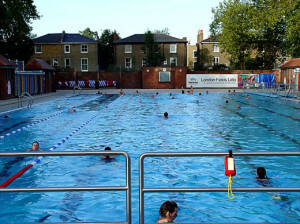 Unless you're a masochist and / or enjoy the thrill of swimming in cold water (something we have experience of), in wintertime Londoners are pretty much limited to one lido: London Fields, the waters of which are cranked up to a balmy 25 degrees C, meaning it attracts swimmers year-round. Unfortunately, the lido's opening times are restricted to daylight hours. The lack of suitable lighting means that, come sundown, the place closes for the day. Opening at 7.45am and closing at 4pm through the winter months means that anybody who works in a 9-5 job finds their swimming options are greatly reduced during the week. The Lido's User Group has come up with a plan. They're campaigning to have Hackney council install an outdoor lighting system, allowing the lido to operate its summertime 6am - 8pm opening times throughout the year. One user group member is an architect, and she has drawn up two schemes, one a combination of underwater lighting and low-level bollards, the other using directional floodlights that sit on 8m poles. To get anywhere with the proposal, the group needs to show that there is strong demand for evening swimming. You can do so by signing their online petition, which is currently a little shy of 200 names. See more on London's lidos.